The new development, as seen in this rendering from a vantage point of Herald and Traveler streets, will be an eight-story building containing 83 condominiums. 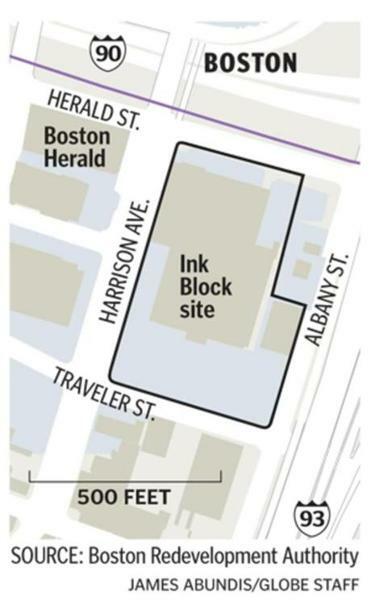 With luxury home prices surging in Boston, the firm that is redeveloping the former Boston Herald site will include condominiums on the South End property, marking a shift in a real estate market that for several years has been dominated by rental unit construction. 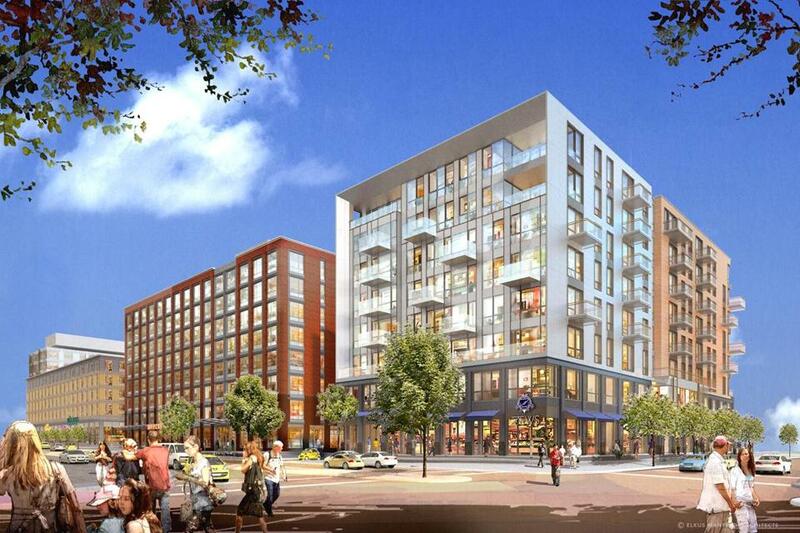 Work on the 83 condo units at Harrison Avenue and Traveler Street is scheduled to begin early next year, part of a six-building complex, called the Ink Block, that will feature a Whole Foods supermarket, restaurants, stores, and 392 rental units. Until now, the project had only included rental units, but its principals said the recent improvements in the housing market persuaded them to switch some of the units to condominiums. A handful of other condominium projects are planned or under construction in the South Boston Innovation District and in the city’s downtown. On its face, the former Herald property does not stand out as an ideal location for luxury condominiums. It is within earshot of truck traffic on adjacent Interstate 93, and that industrial pocket of the South End includes many half-empty parking lots and outdated manufacturing buildings. But the neighborhood is also seeing a burst of redevelopment activity, and real estate specialists said demand for condominiums is skyrocketing in the city’s core neighborhoods, where very few ownership units have been developed in recent years. 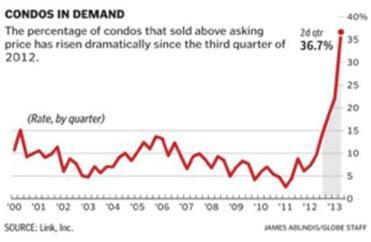 The combination of low supply and high demand has led to a sharp increase in prices during the last two years, with the median selling price for condos in the center city neighborhood now around $538,000, 5.3 percent above this time last year. Buyers are finding it hard to compete in a market where many properties are selling for well over the asking price. In the South End, more than 45 percent of properties between April and July sold at more than the asking price, according to Link, which reported similar percentages for Charlestown, the Fenway, and South Boston. The condominiums at the former Herald property are being marketed for between $550,000 for a one-bedroom and more than $2 million for a penthouse. They will be contained in an eight-story building with close-up views of the Back Bay skyline. The building, to be called Sepia, will feature a rooftop deck, private balconies, a bicycle workshop, and a fitness center, among other amenities. It will be surrounded by new restaurants and stores, including a 50,000-square-foot Whole Foods that will be the chain’s largest store in Boston. The project’s condominiums will be among the first to hit the market since the economic downturn of the last decade, which dried up funding for construction of new ownership units in Boston and around the country. Developer Millennium Partners is finishing construction of a 256-unit condominium building in downtown Boston. Already, more than 75 percent of those units are sold, and Millennium is formally breaking ground Tuesday on a new condominium tower nearby that will include more than 500 units. Real estate brokers said nearly every new unit that hits the market is attracting a swarm of buyers, some of whom are paying cash.